Eugene Jolas began his little magazine career with The Double Dealer, but he found the magazine overly restrictive, and hoped to create a transatlantic place of refuge for experimental writers to express themselves without fear of criticism. With the help of his wife, translator and printer Maria Mcdonald, Jolas created his own creative magazine, transition. The magazine aimed to combat the rigidity of American political and artistic views. Jolas’s travels to Paris helped him fuse the spirit of French modernism with the rebellion and innovation of American writers. The first issue, a heavy, 150-page magazine, was published in 1927 after a long struggle with foreign printing complications. The magazine quickly became a “laboratory of the word” – a place to experiment with and shape new ideas – for Modernists such as James Joyce, William Carlos Williams, H. D., Alfred Kreymborg, Gertrude Stein, and Muriel Rukeyser (Hoffman 176). Political writers, Harlem Renaissance voices, works with psychoanalytic qualities, multinational and multilingual works, and other various artistic schools harmonized in the varied pages. transition eventually morphed from a synthesis of Expressionism and Surrealism into a more philosophical combination of irrational surrealism and language innovation, which the Jolases labeled Vertigralism. transition expanded and slightly shifted its focus, and embraced new media such as sculpture, civil rights activism, carvings, criticism, and cartoons. The diversity of both form and content brought the magazine success for more than ten years. 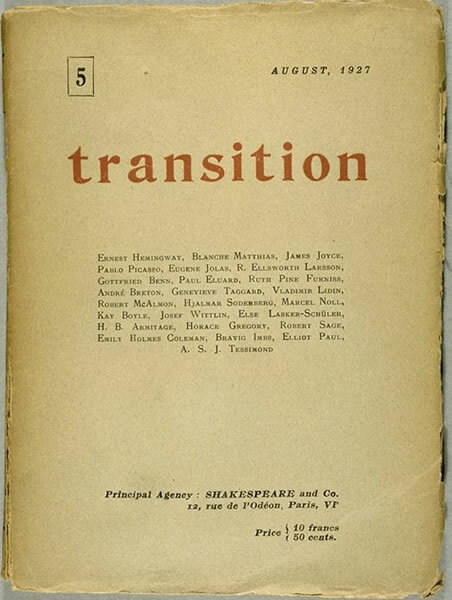 During transition‘s run, Jolas created new literary philosophies, provided inspiration to the avant-garde tradition, and published works that became canonical classics. “Tired of the spectacle of short stories, novels, poems and plays still under the hegemony of the banal word, monotonous syntax, static psychology, descriptive naturalism, and desirous crystallizing a viewpoint…. 3. Pure poetry is a lyrical absolute that seeks an a priori reality within ourselves alone. 4. Narrative is not mere anecdote, but the projection of a metamorphosis of reality. 5. The expression of these concepts can be achieved only through the rhythmic “Hallucination of the Word”. (Rimbaud). 6. The literary creator has the right to disintegrate the primal matter of words imposed on him by text-books and dictionaries. 7. He has the right to use words of his own fashioning and to disregard existing grammatical and syntactical laws. 8. The “litany of words” is admitted as an independent unit. 9. We are not concerned with the propagation of sociological ideas, except to emancipate the creative elements from the present ideology. 10. Time is a tyranny to be abolished. 11. The writer expresses. He does not communicate. 12. The plain reader be damned. “Proclamation.” No. 16-17 (June 1929): 13. New Jersey born John George Eugène Jolas’s cultural standpoint was influenced by his German mother and his French father. He moved to Alsace-Lorraine, France at a young age, where he faced the tensions between French and German languages, societies, and politics. These conflicts, and apprehensions about the German army draft, inspired Jolas to return to America in 1909 with a more poly-national worldview. Though faced with typical immigrant struggles such as poor employment opportunities, language acquisition, and ethnic divisions, Jolas eventually emerged successful as both a journalist and a poet in the American literary scene. He then moved to Paris where he met his wife, Maria McDonald, and began formulating ideas for a little magazine, transition. The magazine marked, as biographers Kramer and Rumold point out, Jolas’ “greatest literary project and most enduring achievement ” (Babel xv). “Ernest Hemingway In His Time: Appearing in the Little Magazine.” Transition. 18 Nov. 2003. Special Collections Department. University of Delaware Library. 22 July 2009. Jolas, Eugene and Robert Sage, eds. Transition Stories: Twenty-three Stories from “Transition.” New York: W. V. McKee, 1929. Kramer, Andreas and Rainer Rumold, eds. Jolas, Eugene. Man from Babel. New Haven: Yale UP, 1998.
transition. 1927 – 1938. New York: Kraus Reprint Corp., 1967.